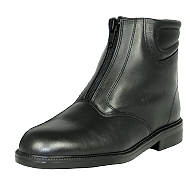 A smart waterproof leather paddock boot that is designed for riding and as yard boot for stable work. This zip boot provides maximum performance, protection and comfort all the year round. 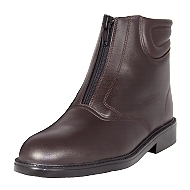 A super comfortable boot ideal for the groom, riding instructor, diy livery and rider. Colour; Dark brown and black leather. Size range : 3 to 10 UK including half sizes. Brilliant in winter for cold feet! But equally as good in summer. The Climate Control Technology will ensure that your feet are comfortable whatever the weather. COOL feet in summer and WARM in winter. this zipper boot is the perfect summer and winter boot whatever the weather. Pound stretcher! These riding boots will last 2 - 2 1/2 times to a comparable product. When purchasing zip boots + gaiters you get 5% discount on both.